Andrew Tosh, founder of GameSim of Orlando, a 3D visualization and GIS applications used in the gaming and military simulation industries, talked about the plans to expand their product Conform into the GIS market. GameSim is looking at 30% growth (2013). Tosh started the company in 2008 and now they have 33 employess. They will do revenue at $3.7 million this year. Vice President of Software Development and Co-founder of Safe Software, Dale Lutz, spoke about the latest release of FME, FME 2012, which has just been released. Safe’s releases of FME are annual, and are designed to always be faster than the previous release and incorporate more file formats than they did before. What is the most significant feature of the 2012 release, Dale? The point cloud or lidar support changes that we made in the last year are very significant. W e came out of the gate last year with our lidar support point cloud and I was impressed how well received that was. What we realized was that the volumes of data were even in an order of magnitude greater than what we thought a year ago. We spent the last year really addressing and optimizing for data volume and we’re very please with how the FME 2012 point handling support can gobble up billions of point clouds and put them into Oracle and chop them into little pieces in very timely ways. Don [Murray] has said that every release of FME has to be faster than the previous one and we did meet that with more than ten percent overall across 5,000 tests, we are more than 10% faster. Even if existing users don’t do anything else they just put on the new release they’re going to be getting their jobs done faster than before. In terms of our overall offering, as you know we have FME Server, and there we’re doing a thing we call notification server which has to do with the notification idea – that not only can we centralize data moving on a server, we can now react and cause it to move when an event happens outside. Kinds of events can be, for example – a file arrives in a folder and that’s a stimulus that can cause a response by our server to upload that file into a database or into a Quality Assurance check on that thing. These are event driven actions, as opposed to the user having to poke the server and saying please do this. One example is a file arriving causing an event – an email arrives and it causes something to happen. A web sensor of some kind posts results – we’ve been doing some demos and playing with web sensors and that data can come in and our server can do something. Now there is a field called complex event processing or CEP and what we really think we’ve got here is spatial complex event processing where an event happens and a transformation process starts. Not only can it move data around but can also take advantage of where that event happened. So that’s the notification addition into our FME Server product family. How many of these new features did customers request? Parts of the new features were requested by people but we generalized their requests into something greater. We know that many of the use cases I mentioned to you are futuristic — they’re ready for the internet of things or the sensor web that people talk about. Practically what people ask for is the first one I mentioned, if the file arrives the folder does something because that’s closer to our traditional space. When I talk about sensor web that flirts with the user space that we’re confident that we’re able to address but we might be ahead of our user base there. You mentioned more file formats in the new FME 2012. The world is always creating more formats – I believe the number is 285 now with FME 2012. Existing formats don’t stay still either, they’re always changing and growing. CityGML had a new version this year, GML is looking at another version, there’s always more happening. The development team has to juggle all this and it’s not getting easier each year. The other half of this is the world of the cloud. Although it’s not a file format, it’s a new place where data can reside. And so in FME another key feature is the fact that we can read and write Google Fusion tables and so there you have a new “format” but it’s not a file, it’s a mystical call out to the cloud. You use FME to put data up there and then you permit it, then instantly the whole universe can share in it. It’s a way of publishing data that can be used by anybody instantly so it’s quite interesting what this opens up for collaboration. How do you address private clouds, which we hear a lot about these days? Private clouds are not on the data format side, but rather on the deployment side. People ask can we install your software and get our own private cloud can we install it on an Amazon system? We do have an answer on all those cases. We have many customers already doing cloud based deployment using our software in the cloud, running in the cloud in a variety of ways. That’s an area that continues to explode. We have moved to using cloud hosted FME for all our training. If you take an FME training class, no matter where you take it, whether it’s online or in person, you’ll be using an FME installation in the cloud. The reason is it’s way easier for us to administer it. But even if you come to our office to do training in our Training Center you’ll be connected to FME in the cloud even though it’s in our own office. We’re doing a soft launch of what we call the FME Store, which is a way for certain parties who belong to the FME ecosystem that build plug ins or extensions for FME to be able to make the rest of the FME community aware of what they’ve created. GISCafe’s Sanjay Gangal conducted an interview with Dale Lutz, co-founder of Safe Software, at Autodesk University 2011 in Las Vegas, Nevada recently. Sanjay: Tell us about Safe Software. Dale: We have been in existence since 1993. We make a product called FME that moves data from where it is to where we want it to be. It now supports around 275 different formats. Safe Software’s FME 2011 release offers point cloud support and more. One of the main enhancements of Safe Software’s FME 2011 release (released today) is new functionality for manipulating point cloud data. Many people must deal with lidar point cloud data as part of their daily work, and they don’t know how to manage it. It’s awkward to deal with because it’s in huge data volumes. Other features of the new release: during the authoring phase users can inspect the data. Historically you had to wait for the authoring to be over and then you could look at all the data at various stages. Now the whole authoring stage is interactive so now rather than make it batch as it was before, when authoring workbench scripts you can stop the transformation process to examine the current state of the data. There is also new database support, and the ability to inspect point clouds. 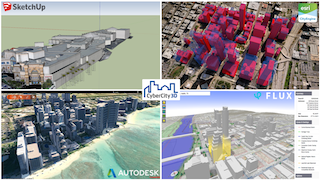 Pointools, a company known in AEC circles for its point cloud data transformation software, has come to GIS.